For burst after burst of uplifting fragrance. An exotic blend of Tropical Lily and Ylang Ylang. Brilliantly clean laundry every time. Convenient and easy to use. Also available in liquid and powder. UK?s No.1 fragrance detergent brand. Surf Tropical Lily & Ylang Ylang is a gorgeous bouquet of two of nature's most exotic and enticing flowers. Feminine and strong, the lily's honeyed, floral scent is a favourite, ranking in the top five most popular fresh cut flowers in the world. The Ylang Ylang flower's sweet aroma seduces the senses and soothes the spirit. Its sensual fragrance is said to re-connect mind and body, creating feelings of euphoria. Surf Tropical Lily & Ylang Ylang with its exotic fragrance is available in washing liquid, washing powder and washing capsules and is suitable for washing both colours and whites. 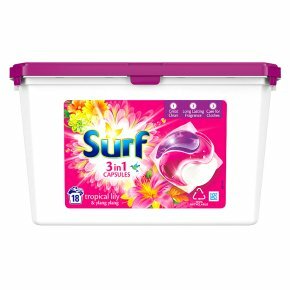 Surf's laundry range brings you the joy of fragrance, long after you've washed your clothes. With burst after burst of uplifting fragrance released right through your day, your laundry stays fragrantly fresh, with a brilliant deep clean you'll love. Surf capsules are extremely easy to use, efficient and convenient for your busy life. Simply pop a single capsule at the back of your washing machine's drum, add your laundry and enjoy the great results of brilliant cleaning and excellent fragrance. For the best results, use one capsule for standard soiling, soft/medium water and a standard load (3-5kg). Use two capsules for heavy soiling, hard water or a larger load (6-8kg). Top Tip: If you notice residue from the laundry capsule on any items of clothing, do not place them in the tumble dryer. If the residue is not rinsed out of the fabric before drying, this could cause permanent staining.